I have since switched to the BatteryMinder Odyssey specific charger. I wanted to make sure to use a real recommended odyssey charger. I'm sure the other ones can do the job. I just felt better with this one knowing it was actually made for that type of battery, and it would be set to the right mode automatically if the power went out and came back on. 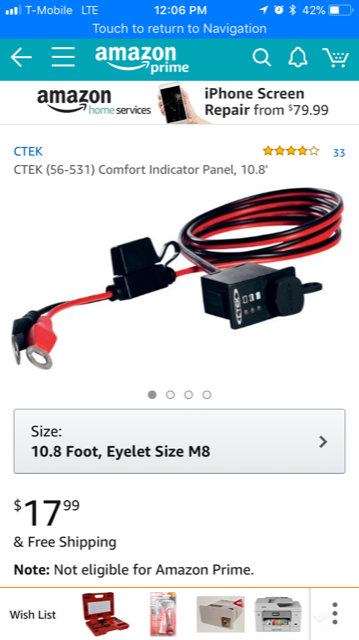 I am looking to get a battery charger/tender and was looking for the Walmart one that Tim had suggested a number of years ago, to charge my Odyssey PC-925 battery. It seems that they no longer carry the WM-2500A model any longer. Does anyone have any suggestions as to what would be a suitable replacement? Thanks. switch will do...as long as you only charge things when you are present. leakage of current, would be very fresh after 3 months of sitting. Both a lot less than the overpriced Battery minder models. Again, I would NOT leave a charger of any kind on a battery unattended. There are several unnecessary risks. I have been using a Battery Minder for Odyssey batteries for years and, based on several articles in Consumer Aviation and Light Plane Mechanic, I leave mine plugged in all the time. These chargers are designed to stay connected all the time and have extended the life of my Odyssey’s by years - plus I always have a fully charged (deep cycle charge) battery when I fly. I used to leave a Battery Tender on them, but switched based on the articles above. The Odyssey is a variant of the AGM technology. I suggest that you do not need a "tender". You need something that can recharge the battery whenever it has been run down. Most any automatic charger with an AGM switch will do...as long as you only charge things when you are present. AGM batteries have a very low self discharge rate, and if there was no leakage of current, would be very fresh after 3 months of sitting. > I am looking to get a battery charger/tender and was looking for the Walmart one that Tim had suggested a number of years ago, to charge my Odyssey PC-925 battery. It seems that they no longer carry the WM-2500A model any longer. Does anyone have any suggestions as to what would be a suitable replacement? Thanks. I hear the claims, I see no data to support the claims, just anecdotes. months. My Odyssey is going strong without a BatteryMinder. The self discharge rate is one tenth that of wet acid for starters. degrees. Both those temps are easily exceeded here in Aridzona. resultant damage if it fails while unattended. They only warrant to repair the unit for 5 years, nothing more. reduce your budget for avgas. on ramp with no power available and temps down to -60. Just to add to the discussion. I have used a battery tender on and off. If I power the airplane on the ground, I put it on and leave it on until the next time I am at the airport. My 925 is over 10 years old, I have been flying 9 years and 8 months. Battery still going strong. I had it tested two years ago and it tested great. I may test it again this cycle, it is getting old. I have a backup 680 in the airplane, so it is not as critical to me. I can operate off the 680 if need be. So, my experience has been great with the 925. I would say I have had it on the tender 25% of the time. But, I do not think I have ever let the battery sit discharged. trip as well. I probably use mine a dozen times a year. reset its settings. My schumachers default to lead acid settings. why the Minders are $239-ish now...I think I paid more like $170. Odyssey will self discharge fast enough to worry about it. it maybe before you fly. to stay on a 5-6 year plan. I have been using this charger on all my vehicles and Odessey Batt. Works fantastic. Funny you should list that one Rob. had the battery drain on me 4 times now. I'd say they would work good for your odyssey also. I have been using this charger on all my vehicles and Odessey Batt. > I have since switched to the BatteryMinder Odyssey specific charger. > I wanted to make sure to use a real recommended odyssey charger. >> what would be a suitable replacement? Thanks. I have ½ dz of them in two locations. They have lots of accessories such as a panel female plug that I have installed on the RV’s baggage bulkhead. They seem to change the Odessey just fine. They also have BMW adopters as part of their cigarette lighter plug. Mercedes Benz chargers are basically are the same with MB logo on the box. > I have been using this charger on all my vehicles and Odessey Batt. Works fantastic. >> I have since switched to the BatteryMinder Odyssey specific charger. >> I wanted to make sure to use a real recommended odyssey charger. >> I'm sure the other ones can do the job. I just felt better with this one knowing it was actually made for that type of battery, and it would be set to the right mode automatically if the power went out and came back on. >>> I am looking to get a battery charger/tender and was looking for the Walmart one that Tim had suggested a number of years ago, to charge my Odyssey PC-925 battery. It seems that they no longer carry the WM-2500A model any longer. Does anyone have any suggestions as to what would be a suitable replacement? Thanks. Having ruined a number of 680s during my 10 year odyssey, I've come to the same conclusions as Kelly has below. I'm a bit late to this discussion but here one thing I have empirical evidence for; undercharging these batteries will slowly kill them, slowly but inevitably. Inadequate voltage in aircraft charging circuit (read the spec sheet and obey it). This seems straight forward but do check that the voltage you are displaying is the voltage the battery sees. I was measuring the voltage for my two charging circuits in two different places (EIS and EFIS). Turned out one was accurate and one was not. Old battery tenders/minders not intended for AGM batteries. During my build, I had a few left over from my gel cell days in gliders. They will not adequately charge a discharged 680 but it takes about 1.2 years to discover that. I'm not sure, but using an old one to just maintain is worse than throwing the old thing away. If there are tenders/minders on the market now that are unsuitable for AGM batteries, I wouldn't know, but see Kelly's points below - you just don't need one, you need an AGM capable charger. Parasitic loads when not in use. My load was fully documented; the clocks in my (3) GRT EFISs (this has since been eliminated thru an enlightened SW upgrade). It was a very small load but it was 3X a small load. I have 2 batteries but the load was connected to only one, which made diagnosis easier but more expensive. Why is such a small load in a frequently flown plane such a problem? Didn't grandpa drive cars with electric clocks? That didn't seem to be a problem. Well it was occasionally a problem. And with AGMs, a parasitic load seems to be equivalent to undercharging it; the battery is sits in a slowly declining state then is undercharged the next time it gets hit with the starter load. I don't know whether that is actually the mechnism but I KNOW a parasitic load will slowly, inevitably, kill a 680 or 2. I guess you could keep it on an AGM certified minder/tender but I'd suggest hunting down the load and killing it. Things will work just fine with any 3 of these conditions for 1-2 years then they won't. It's a slow death that may mystify you for $awhile$. I have a boat but 680s make lousy anchors. Speaking of boats, my little jon boat is parked next to my '10. The Walmart/Schumacher charger with settings for AGM, Lead and Gel Cell(?) batteries worked fine until I apparently wore it out charging the lead acid trolling motor battery every other day. I'm going to separate chargers as a result. Regarding 'empirical evidence'; label, log and track your batteries, especially if you have 2 of the same installed like I do in my Z-14 scheme. That data is the key to figuring out whether you have slow death problems or not and what might be causing them. Problems are easily mitigated with a dual batt/alt/bus Z-14 which is good and bad. It can delay diagnosis of electrical system problems because they aren't so critical. Which means that you can kill 2 batteries with one problem before you decide to act. You might add this to your order for an easy plugin on installed on the baggage compartment. To all of the folks who provided suggestions, thanks. 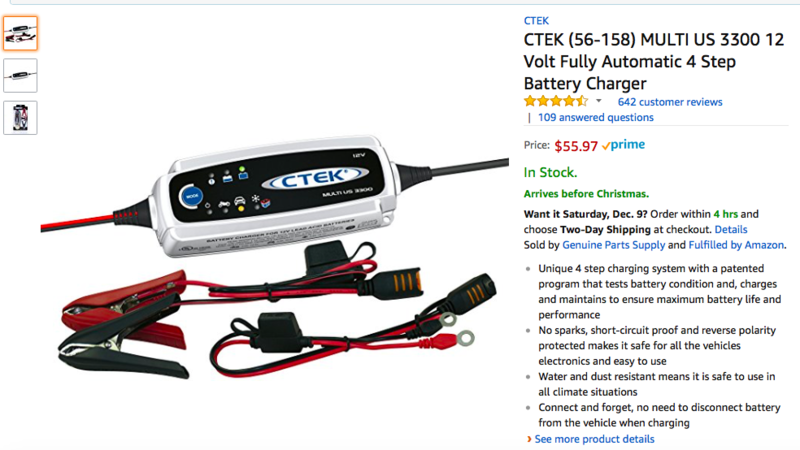 I will be putting the CTEK charger on my Christmas list. Thanks. I have been using this charger on all my vehicles and Odessey Batt. ï¿½Works fantastic. I thought I'd weigh in a bit with my own experience on parasitic loads on a PC680.. I have a dual battery configuration, with the idea being that I could power up avionics, enter flight plans, do pre-start radio calls, etc. off the one battery (the 680) and not have worry about draining the battery for engine start, as my other battery takes care of that. Also, the 680 is also connected to the "always on" pin for two of my EFISes (Advanced Flight Systems) which gives them a better orderly shutdown, clock maintenance (I presume) and the ability to run off the 680 as a backup battery if I have to turn my master off in flight for some reason. It's also connected to the "trickle charge" pin of a TCW IBBS Nimh battery pack (4mA max) used as a backup battery for other purposes. Conceptually, it works well. And in practice it *did* work well for the first little while - even in cases where I hadn't operated the aircraft for a month and the 680 was under those small parasitic loads for a long time, the voltage on the 680 measured fine and it ran my avionics for a reasonable amount of time. But lately I've noticed that my 680 can't maintain a charge for long at all if under any kind of load. I installed it around 3 years ago (only one of those years flying, but for the other two, it was installed and under the same electrical loads as now while I completed construction of the plane). As long as only a couple of amps are flowing through, it can maintain its voltage reasonably well before drooping. But if larger loads (ie: 7 or 8 amps) are present, it drains extremely rapidly. • Inadequate voltage in aircraft charging circuit (read the spec sheet and obey it). This seems straight forward but do check that the voltage you are displaying is the voltage the battery sees. I was measuring the voltage for my two charging circuits in two different places (EIS and EFIS). Turned out one was accurate and one was not. • Old battery tenders/minders not intended for AGM batteries. During my build, I had a few left over from my gel cell days in gliders. They will not adequately charge a discharged 680 but it takes about 1.2 years to discover that. I'm not sure, but using an old one to just maintain is worse than throwing the old thing away. If there are tenders/minders on the market now that are unsuitable for AGM batteries, I wouldn't know, but see Kelly's points below - you just don't need one, you need an AGM capable charger. • Parasitic loads when not in use. My load was fully documented; the clocks in my (3) GRT EFISs (this has since been eliminated thru an enlightened SW upgrade). It was a very small load but it was 3X a small load. I have 2 batteries but the load was connected to only one, which made diagnosis easier but more expensive. Why is such a small load in a frequently flown plane such a problem? Didn't grandpa drive cars with electric clocks? That didn't seem to be a problem. Well it was occasionally a problem. And with AGMs, a parasitic load seems to be equivalent to undercharging it; the battery is sits in a slowly declining state then is undercharged the next time it gets hit with the starter load. I don't know whether that is actually the mechnism but I KNOW a parasitic load will slowly, inevitably, kill a 680 or 2. I guess you could keep it on an AGM certified minder/tender but I'd suggest hunting down the load and killing it. > The Odyssey is a variant of the AGM technology. I suggest that you do not need a "tender". You need something that can recharge the battery whenever it has been run down. Most any automatic charger with an AGM switch will do...as long as you only charge things when you are present. > AGM batteries have a very low self discharge rate, and if there was no leakage of current, would be very fresh after 3 months of sitting. > Both a lot less than the overpriced Battery minder models. > Again, I would NOT leave a charger of any kind on a battery unattended. > There are several unnecessary risks. >> I am looking to get a battery charger/tender and was looking for the Walmart one that Tim had suggested a number of years ago, to charge my Odyssey PC-925 battery. It seems that they no longer carry the WM-2500A model any longer. Does anyone have any suggestions as to what would be a suitable replacement? Thanks. fair amount and then use a constant current charger or something else. before actually flying with it. > Having ruined a number of 680s during my 10 year odyssey, I've come to the same conclusions as Kelly has below. I'm a bit late to this discussion but here one thing I have empirical evidence for; undercharging these batteries will slowly kill them, slowly but inevitably. > • Inadequate voltage in aircraft charging circuit (read the spec sheet and obey it). This seems straight forward but do check that the voltage you are displaying is the voltage the battery sees. I was measuring the voltage for my two charging circuits in two different places (EIS and EFIS). Turned out one was accurate and one was not. > • Old battery tenders/minders not intended for AGM batteries. During my build, I had a few left over from my gel cell days in gliders. They will not adequately charge a discharged 680 but it takes about 1.2 years to discover that. I'm not sure, but using an old one to just maintain is worse than throwing the old thing away. If there are tenders/minders on the market now that are unsuitable for AGM batteries, I wouldn't know, but see Kelly's points below - you just don't need one, you need an AGM capable charger. > • Parasitic loads when not in use. My load was fully documented; the clocks in my (3) GRT EFISs (this has since been eliminated thru an enlightened SW upgrade). It was a very small load but it was 3X a small load. I have 2 batteries but the load was connected to only one, which made diagnosis easier but more expensive. Why is such a small load in a frequently flown plane such a problem? Didn't grandpa drive cars with electric clocks? That didn't seem to be a problem. Well it was occasionally a problem. And with AGMs, a parasitic load seems to be equivalent to undercharging it; the battery is sits in a slowly declining state then is undercharged the next time it gets hit with the starter load. I don't know whether that is actually the mechnism but I KNOW a parasitic load will slowly, inevitably, kill a 680 or 2. I guess you could keep it on an AGM certified minder/tender but I'd suggest hunting down the load and killing it. > Things will work just fine with any 3 of these conditions for 1-2 years then they won't. It's a slow death that may mystify you for $awhile$. I have a boat but 680s make lousy anchors. > Speaking of boats, my little jon boat is parked next to my '10. The Walmart/Schumacher charger with settings for AGM, Lead and Gel Cell(?) batteries worked fine until I apparently wore it out charging the lead acid trolling motor battery every other day. I'm going to separate chargers as a result. > Regarding 'empirical evidence'; label, log and track your batteries, especially if you have 2 of the same installed like I do in my Z-14 scheme. That data is the key to figuring out whether you have slow death problems or not and what might be causing them. Problems are easily mitigated with a dual batt/alt/bus Z-14 which is good and bad. It can delay diagnosis of electrical system problems because they aren't so critical. Which means that you can kill 2 batteries with one problem before you decide to act. >> The Odyssey is a variant of the AGM technology. I suggest that you do not need a "tender". You need something that can recharge the battery whenever it has been run down. Most any automatic charger with an AGM switch will do...as long as you only charge things when you are present. >> AGM batteries have a very low self discharge rate, and if there was no leakage of current, would be very fresh after 3 months of sitting. >> Both a lot less than the overpriced Battery minder models. >> Again, I would NOT leave a charger of any kind on a battery unattended. >> There are several unnecessary risks. While risking the ire of “the battery charger war” ….. several articles have been written in the past in Light Plane Maintenance and Aviation Consumer that discuss whether or not to keep a charger on your battery(ies). You should go back and research those. Based on those, I purchased a Battery Minder designed specifically for the 2 PC680’s I have in my RV10. Since I don’t fly my plane at least an hour each week (the time required to fully replace the lost charge from starting) I keep a single Battery Minder connected to my 2 batteries. My first set of batteries were removed at the 6 year point, and were going strong. I keep one around the hangar for odd use and 12years on, it is still providing good amps. About to fly my newly built RV8 and was debating whether to get the increased cost Battery Minder when a friend turned me onto the Odyssey built chargers designed specifically for the Odyssey batteries (they come in 3 different charging amp versions). I just hooked up the 6amp version ($109 from AutoZone) and it has all of the capabilities of the Battery Minder except for the temperature sensor. My friend has been using one for his homebuilt for years and swears by it. Bottom line - unless you fly at least 1 hr (continuous flight time) once a week, your batter(ies) are slowly losing capacity over time…..and if you have parasitic loads on them when in the hangar, a smart charger like the Odyssey or Battery Minder plugged in while the plane sits in the hangar are an absolute must. post-start flight to fully recharge them. hook it up to a charger to top it off. that ships with every Odyssey. I just had to read and obey. > I thought I'd weigh in a bit with my own experience on parasitic loads on a PC680..
> I have a dual battery configuration, with the idea being that I could power up avionics, enter flight plans, do pre-start radio calls, etc. off the one battery (the 680) and not have worry about draining the battery for engine start, as my other battery takes care of that. Also, the 680 is also connected to the "always on" pin for two of my EFISes (Advanced Flight Systems) which gives them a better orderly shutdown, clock maintenance (I presume) and the ability to run off the 680 as a backup battery if I have to turn my master off in flight for some reason. It's also connected to the "trickle charge" pin of a TCW IBBS Nimh battery pack (4mA max) used as a backup battery for other purposes. > Conceptually, it works well. And in practice it *did* work well for the first little while - even in cases where I hadn't operated the aircraft for a month and the 680 was under those small parasitic loads for a long time, the voltage on the 680 measured fine and it ran my avionics for a reasonable amount of time. But lately I've noticed that my 680 can't maintain a charge for long at all if under any kind of load. I installed it around 3 years ago (only one of those years flying, but for the other two, it was installed and under the same electrical loads as now while I completed construction of the plane). > As long as only a couple of amps are flowing through, it can maintain its voltage reasonably well before drooping. But if larger loads (ie: 7 or 8 amps) are present, it drains extremely rapidly. >> Having ruined a number of 680s during my 10 year odyssey, I've come to the same conclusions as Kelly has below. I'm a bit late to this discussion but here one thing I have empirical evidence for; undercharging these batteries will slowly kill them, slowly but inevitably. >> • Inadequate voltage in aircraft charging circuit (read the spec sheet and obey it). This seems straight forward but do check that the voltage you are displaying is the voltage the battery sees. I was measuring the voltage for my two charging circuits in two different places (EIS and EFIS). Turned out one was accurate and one was not. >> • Old battery tenders/minders not intended for AGM batteries. During my build, I had a few left over from my gel cell days in gliders. They will not adequately charge a discharged 680 but it takes about 1.2 years to discover that. I'm not sure, but using an old one to just maintain is worse than throwing the old thing away. If there are tenders/minders on the market now that are unsuitable for AGM batteries, I wouldn't know, but see Kelly's points below - you just don't need one, you need an AGM capable charger. >> • Parasitic loads when not in use. My load was fully documented; the clocks in my (3) GRT EFISs (this has since been eliminated thru an enlightened SW upgrade). It was a very small load but it was 3X a small load. I have 2 batteries but the load was connected to only one, which made diagnosis easier but more expensive. Why is such a small load in a frequently flown plane such a problem? Didn't grandpa drive cars with electric clocks? That didn't seem to be a problem. Well it was occasionally a problem. And with AGMs, a parasitic load seems to be equivalent to undercharging it; the battery is sits in a slowly declining state then is undercharged the next time it gets hit with the starter load. I don't know whether that is actually the mechnism but I KNOW a parasitic load will slowly, inevitably, kill a 680 or 2. I guess you could keep it on an AGM certified minder/tender but I'd suggest hunting down the load and killing it. >> Things will work just fine with any 3 of these conditions for 1-2 years then they won't. It's a slow death that may mystify you for $awhile$. I have a boat but 680s make lousy anchors. >> Speaking of boats, my little jon boat is parked next to my '10. The Walmart/Schumacher charger with settings for AGM, Lead and Gel Cell(?) batteries worked fine until I apparently wore it out charging the lead acid trolling motor battery every other day. I'm going to separate chargers as a result. >> Regarding 'empirical evidence'; label, log and track your batteries, especially if you have 2 of the same installed like I do in my Z-14 scheme. That data is the key to figuring out whether you have slow death problems or not and what might be causing them. Problems are easily mitigated with a dual batt/alt/bus Z-14 which is good and bad. It can delay diagnosis of electrical system problems because they aren't so critical. Which means that you can kill 2 batteries with one problem before you decide to act. >>> The Odyssey is a variant of the AGM technology. I suggest that you do not need a "tender". You need something that can recharge the battery whenever it has been run down. Most any automatic charger with an AGM switch will do...as long as you only charge things when you are present. >>> AGM batteries have a very low self discharge rate, and if there was no leakage of current, would be very fresh after 3 months of sitting. >>> Both a lot less than the overpriced Battery minder models. >>> Again, I would NOT leave a charger of any kind on a battery unattended. >>> There are several unnecessary risks. >>>> I am looking to get a battery charger/tender and was looking for the Walmart one that Tim had suggested a number of years ago, to charge my Odyssey PC-925 battery. It seems that they no longer carry the WM-2500A model any longer. Does anyone have any suggestions as to what would be a suitable replacement? Thanks.